"Grandmother's recipe! 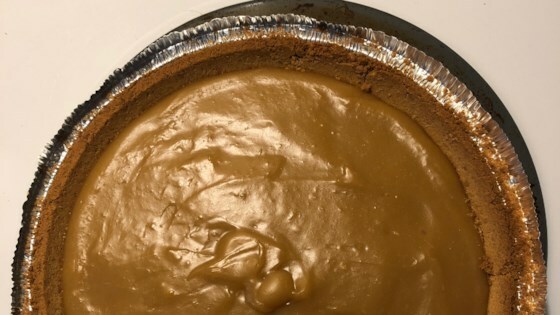 Try this creamy butterscotch pie, one bite and you'll be wanting more!" Preheat oven to 350 degrees F (175 degrees C). Heat oats on a baking sheet in preheated oven for 12 minutes. Set aside to cool. To Make Crust: In a medium bowl combine oats and 1/4 cup brown sugar together; mix in 1/3 cup butter. Press firmly onto bottom and sides of a 8 inch pie pan. Chill for 1 hour. To Make Filling: Combine 3/4 cup brown sugar, flour, salt and milk in a medium saucepan. Cook over medium heat until thick, stirring constantly. Remove from heat and stir in 3 tablespoons butter and vanilla. Transfer mixture to a medium bowl; cover with foil and refrigerate for 1 hour or until cold. Once cold, fold in 1/2 cup of the whipped cream. Pour mixture into pie shell; chill until set. When ready to serve, top with dollops of 1/4 cup of whipped cream and arrange 6 pecan halves decoratively on top of pie. This pie never set up, and the flavor of the crust with the toasted oats just didn't jive with the filling flavors. The filling was very rich. I probably will not make this pie again. I made this for a friend as a "Make her fell better" gift. Got lots of raves. Thanks.